The theming was subtle, but I did manage to find Sebastian hanging over one of the booths near our table. Sebastian's Bistro does have an allergy-friendly menu that lists options for people with gluten/wheat, milk, egg, soy, fish, shellfish, peanut, and tree nut allergies. Our server told me that Sebastian's Bistro does not have a dedicated fryer, so I would have to avoid anything that was fried, even if it was marked safe for gluten/wheat allergies. 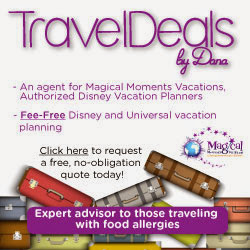 I have never dined at a Disney restaurant that marked a dish as gluten-friendly if it was made in a shared fryer. This is definitely something I need to contact Special Diets about. 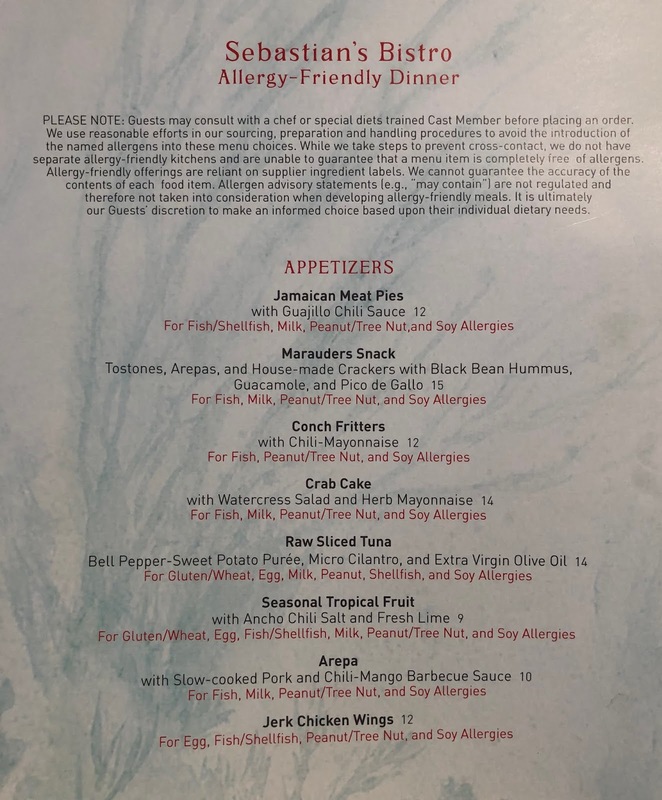 Hopefully, Sebastian's Bistro will remedy this situation in the future, by making the conch fritters gluten free so the fryer is not contaminated, correcting the menu, or by adding a second fryer for gluten free orders. 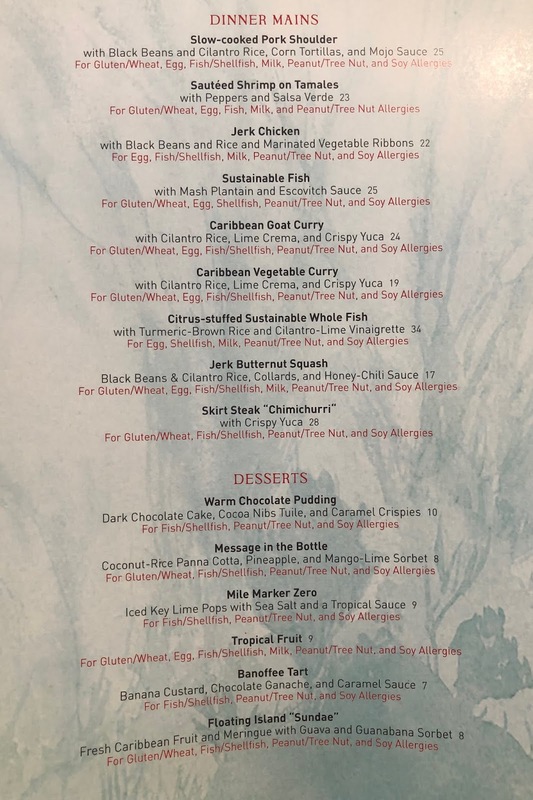 I had hoped to order the skirt steak chimichurri, but the crispy yuca are made in a shared fryer, so I chose the sustainable fish with mashed plantains and escovitch sauce instead. 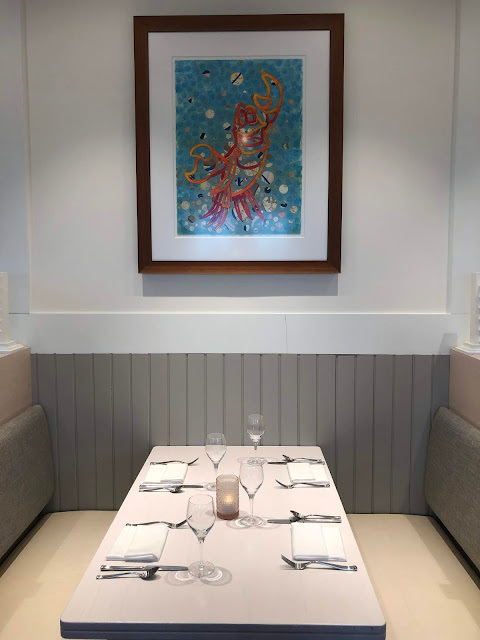 My meal was the last one to arrive at our table, but while I was waiting, our server mentioned that the chefs were taking extra time with my meal to make sure that there was no cross contamination. Everything on my plate was so fresh tasting, and I loved the combination of flavors. 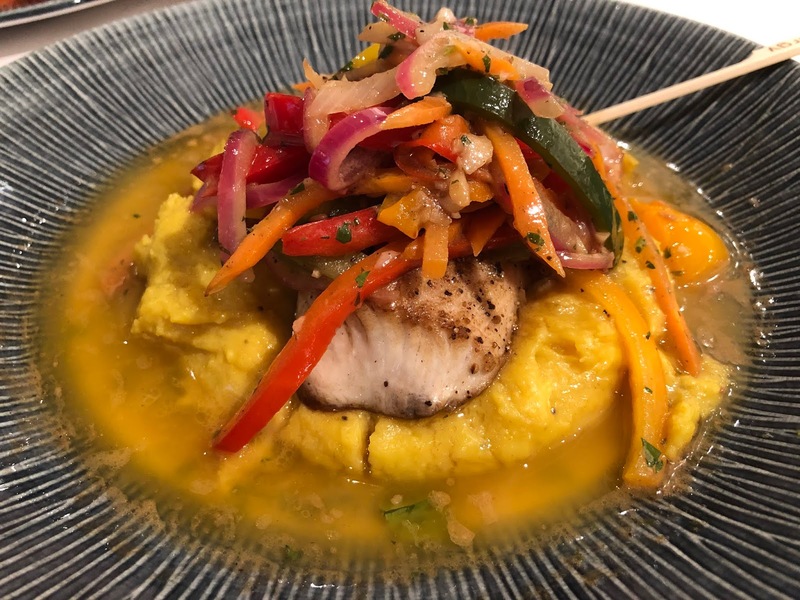 The mashed plantains were definitely the best part of this dish, and their sweetness paired well with the fish and the escovitch sauce. Our server warned me that the escovitch sauce is a little vinegary, which is was, but I enjoyed it. My vegetables were cooked to perfection, and paired well with everything else on the plate. This really was an amazing entree, that I would definitely order again on future visits. My husband ordered the sauteed shrimp on tamales with peppers and salsa verde, another gluten-friendly option on the menu. He asked that it be marked as an allergy so I could taste it. I was really impressed with his dish, and I would have been happy to have this as my entree if I had chosen it. 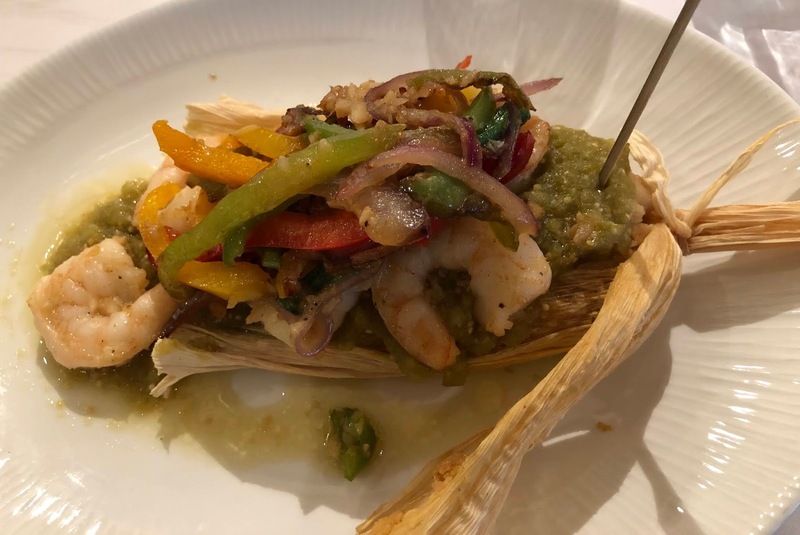 The shrimp were super fresh, and everything on the plate was delicious. For dessert, we ordered all the gluten-friendly options - the floating island sundae, the message in a bottle, and tropical fruit. Sadly, I did not manage to get a picture of the tropical fruit before my daughter Emma dug into it. We were given two pieces of pineapple, two pieces of mango, and two pieces of papaya. Emma and I were disappointed in the small portion, and that the mango and papaya were not ripe. 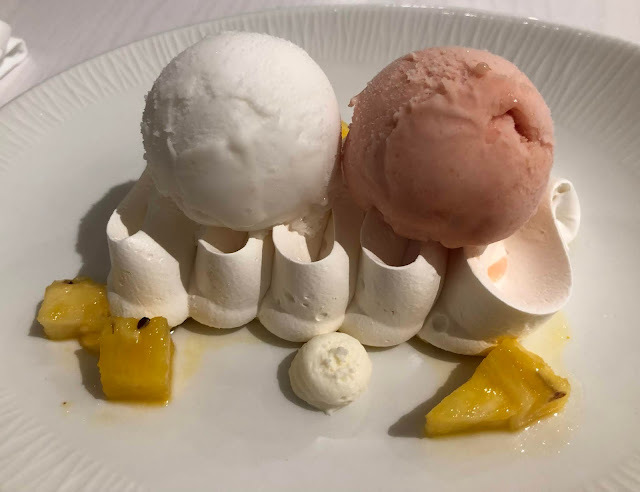 My daughter Katie and I shared the floating island sundae with meringue, fresh Caribbean fruit, and guava and guanabana sorbet. We both enjoyed this dessert, but two times I shot meringue across the table trying to cut it. 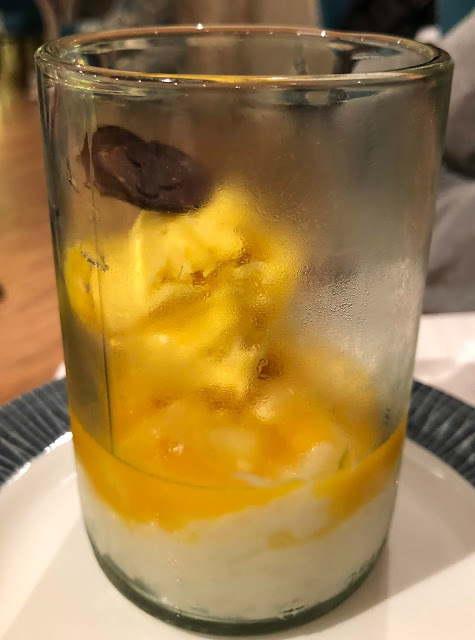 My favorite dessert was probably the Message in a Bottle with coconut-rice panna cotta, pineapple, and mango-lime sorbet. I do not like the taste of coconut, but I am pretty sure this dish only contains coconut milk, so it did not bother me. 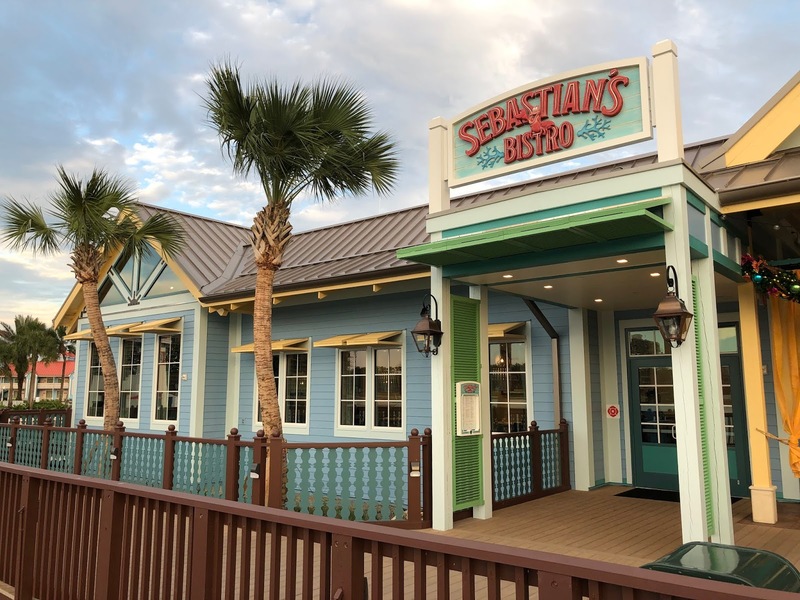 Overall, we enjoyed our meals at Sebastian's Bistro, and look forward to dining there again on future trips to Disney World. My gluten-eating daughters shared the Caribbean pull-apart rolls, the Marauders Snack, and the arepa with slow-cooked pork and chili-mango barbecue sauce. 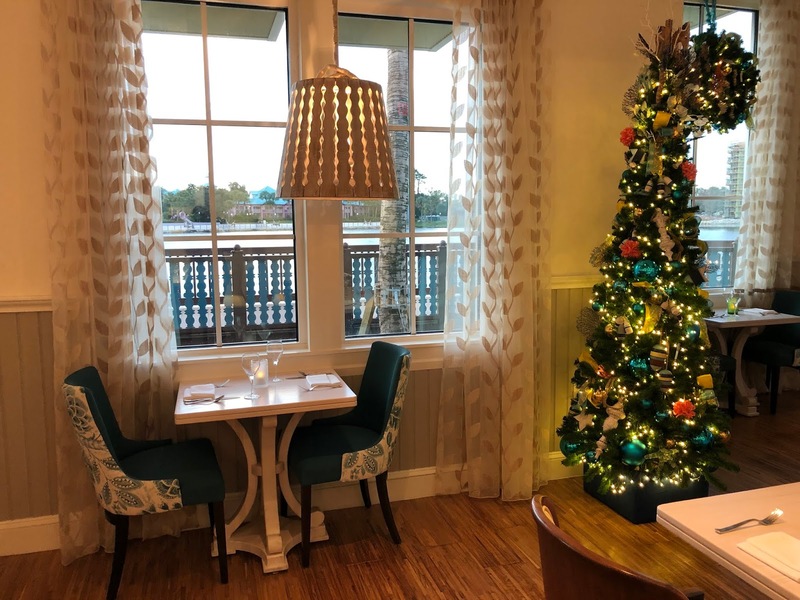 You can read more about Sebastian's Bistro, view their menu and hours, and make advance dining reservations on Disney's website. 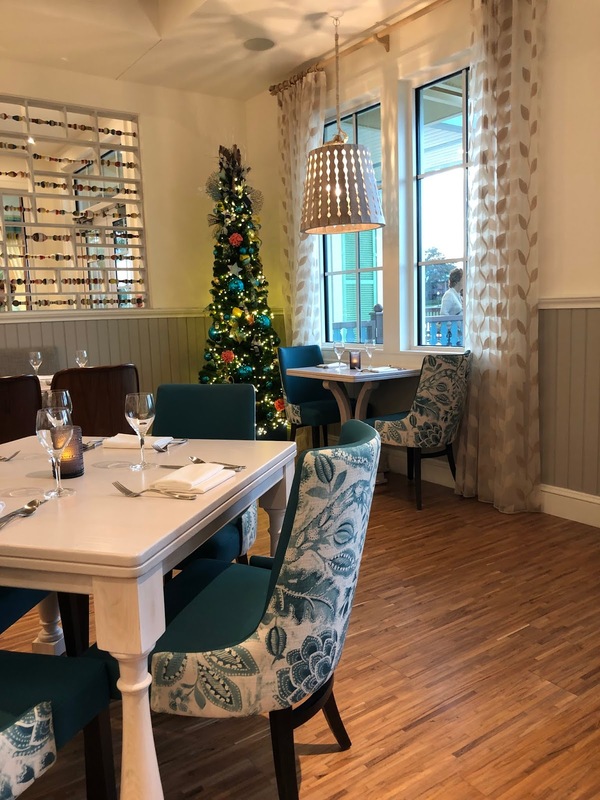 What are your favorite gluten free options at Sebastian's Bistro?